One of the joys of owning a fish tank is being able to see your display "pop" through the clean, polished look of crystal-clear water. Unfortunately, cloudy water in a fish tank can be one of the biggest and most common frustrations that fish tank owners experience. Yet, with a few key steps and the proper maintenance, anyone can enjoy a crystal-clear fish tank every day. Your freshwater tank should be sparkling clear at all times. Ideally, you will want both an external filter (with charcoal-filled pads) and an internal, under-gravel filter (with either charcoal pellets or ammonia-removing white pellets). Make sure you get appropriately-sized filters for your tank (refer to the guides on the packaging). If the size of your tank is the maximum size that should be supported by a particular external filter model, select the next-largest filter. Every month or two, change out approximately 1/3 of your fish tank water. Use a siphon to empty the water into a bucket. While siphoning the water, use the fat end of the siphon tube to pull excess waste out of the gravel. Push the tube into about one inch of gravel and hold it there for a couple of seconds before pulling it out and moving on to the next spot. Repeat for the entire fish-tank bottom, and try to finish before you have siphoned out the appropriate amount of water. Every few months, replace the pellets in your under-gravel filter with a fresh supply. For your external filter, replace the pad or pads once you see water overflowing back into the tank without passing through the pads. If you only have one pad, you might need to use a biological filtration booster to help maintain good biological filtration once the pad has been changed. If you have two pads, replace only one at first to maintain good biological filtration. After a couple of weeks, replace the second pad. Biological filtration is a very important key to remember when attempting to maintain a crystal-clear aquarium. You must ensure that a strong supply of "good" bacteria remains in your tank in order to avoid cloudy water. Do not scrub your tank or your filter clean unless absolutely necessary. Instead, keep a plecostomus in your tank to eat excess algae. 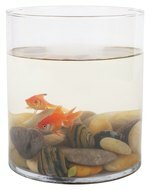 If you do not yet have an established aquarium (if everything is brand new and squeaky-clean), use a biological filtration booster, such as Stress Zyme, to help get the process started.